Date: Nov 22 2018, 11 a.m. - 1:30 p.m. 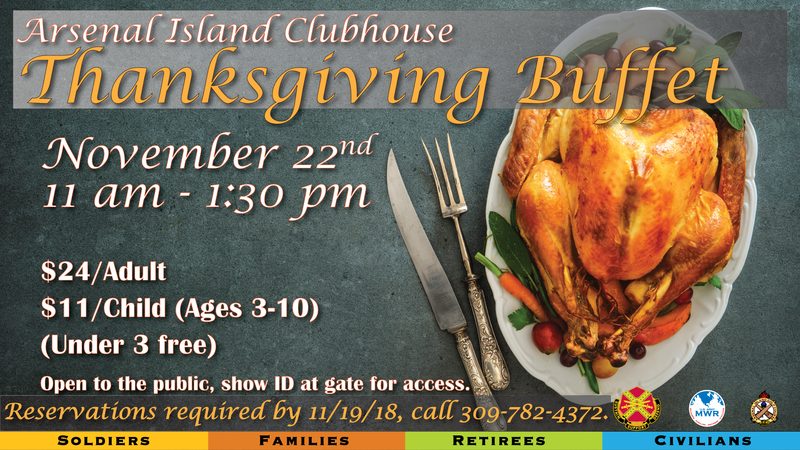 Gather with family and friends at the beautiful and historic Arsenal Island Clubhouse for a Thanksgiving buffet featuring holiday favorites like honey glazed ham, roast turkey with cranberry sauce, top sirloin with mushroom gravy with mashed potatoes to pile it all on and of course pumpkin pie from the Arsenal Island Clubhouse dessert table. Reservations required by 11/19/19, please call +1 (309) 782-4372.